Aircraft is Aerotrek Aircraft. 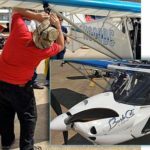 A seller of tricycle gear and taildragger aircraft, longtime light aircraft businessman Rob Rollison settled on Aerotrek. 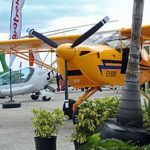 Over the years Aerotrek has firmly established itself on the Top-20 market share chart and you truy have to examine one of these beauties to appreciate the attention to detail. 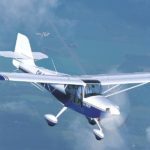 At only $88,950 (as of summer 2016, check with Aerotrek for current information)... Aerotrek A240 and A220 remain price value leaders among more than 100 Special Light-Sport Aircraft. 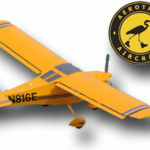 Yet especially with its newly standard radio, intercom, transponder-encoder and the beefy 100-hp Rotax 912 (up from the former 80-hp model that is still available), Aerotrek certainly doesn't act like a bargain-priced airplane. However, it does use entirely conventional construction executed by craftsmen who obviously care a lot about the final appearance of the plane they're building. 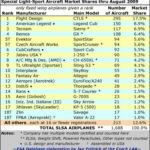 Rollison sells more than aircraft through his related AirplaneGear.com enterprise which represents high quality items like LightSPEED and Peltor headsets, Xcom radios and Becker avionics, Lynx helmets, Microair panel components plus other items too numerous to list here. Rob is a most engaging person with a keen sense of humor. You'll like talking to him and you can expect honest, informed advice about flying products. Give him a call, send email, or visit his websites that are loaded with photos of the A240 or A220 plus the gear he sells. The fourteenth running of the U.S. 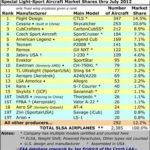 Sport Aviation Expo is history and if this is how the rest of the year goes, I predict a stronger year for LSA sales. 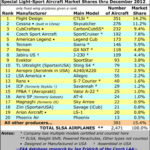 ­Aerotrek has steadily risen from an unknown brand to the #9 position in the all-time-fleet market share. 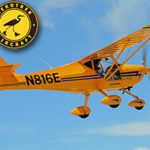 The Marana Regional Airport, in Marana Arizona was the site of the first annual U.S.
Aerotrek supplies a popular and well-priced everything but, you know, having a nice airplane isn’t enough. Aerotrek and their dual models — the A220 taildragger and the A240 trigear — have been an impressive performer in the market share race, steadily moving up our chart. MIDWEST LSA EXPO 2012 — One of our series of many short videos from the fall show, this one on the Aerotrek A240. 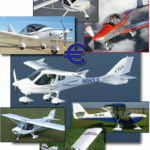 Aerotrek is the new name for a pair of Special Light-Sport Aircraft, the tricycle gear A240 and the taildragger A220. Media people (like me) flock to airshows looking for the new stories, new airplanes, new avionics, new company developments… whatever is new. 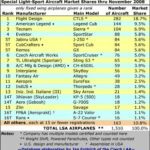 When this website went live a few months before the Sport Pilot & Light-Sport Aircraft rule was announced at Oshkosh 2004, it began life as an archive of several hundred pilot reports I had written for a number of print magazines in aviation. Not long ago, I posted about Kitfox tending to business and expressing regret that they chose to stay home in Idaho versus making the trip to the Sebring LSA Expo 2014. You may have missed it. If so, this article provides another look at a LSA provider that I consider something of a “sleeper” … and if you do not know that term, it’s meant to be positive yet refer in this case to a company that does its thing well if somewhat quietly. Our annual review of LSA Market Share brings our updated fleet chart and a second chart showing prior-year registrations. 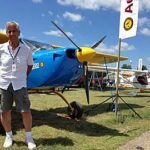 Our roving British journalist, the always-entertaining Dave Unwin, reports on the UK’s LAA Rally event, giving ByDanJohnson.com readers a taste of light aviation in England. We’ve been getting requests for market share information and I am happy to provide an update, thanks to my European associate Jan Fridrich who does the hard work of sifting through FAA’s database. 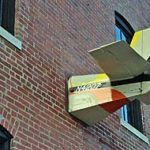 Aerotrek may be one of those “sleepers.” You know, the kind of company that does well, has few problems, and doesn’t need to make a lot of noise to be successful. After a tough winter in most parts of the USA, spring evidently arrived early with 80-degree temperatures as far north as Minnesota… all before Sun ‘n Fun. As the challenging year for aircraft sales grinds on, Light-Sport Aircraft continue to hold their own. With one month to go (and it’s hard to imagine a big December), we have figures to report for this most extraordinary year. Splog: Like Economy, the Euro Is Down but You Gain! This week we’ve heard of a couple price rollbacks based on the euro/dollar exchange rate favoring the dollar. 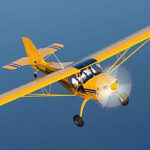 Splog: High Priced Light-Sport Aircraft; What’s Going On? 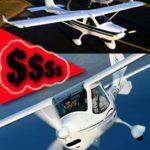 Lots of folks are wondering about, or complaining about, the seemingly high prices of Light-Sport Aircraft. 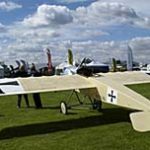 Now we count 32 new Special Light-Sport Aircraft that have won certification…all within less than one year! 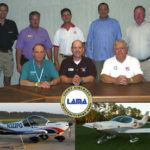 Odds are you’ve heard of LAMA, the Light Aircraft Manufacturers Association, founded in the earliest days of ultralights and gaining renewed importance in this era of Light-Sport Aircraft. 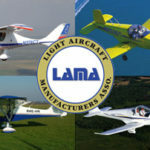 In a year of facilitating independent audits for Special Light-Sport Aircraft, LAMA, the Light Aircraft Manufacturers Association, completed reviews of six companies: IndUS (Thorpedo); Jihlavan (Kappa KP-5); Aeropro (EuroFox); Flight Design (CT); Czech Aircraft Works (SportCruiser, Mermaid, & Parrot); and Evektor (SportStar). 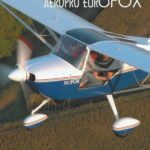 Repatriate means “to restore or return to the country of origin.” That’s exactly what’s happening with the Aeropro EuroFox, an Eastern European-built light-sport aircraft (LSA) based on American design work. 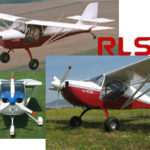 His Rollison Light Sport Aircraft (RLSA) company has been building a fleet of aircraft for sale from European sources. 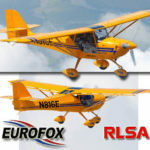 EuroFox has remained one of the value price leaders among all 57 LSA models.